Back in April 2018 we hit our target of recruiting 2,500 prison officers, 7 months ahead of schedule. But that doesn't mean we’ve stopped recruiting. We need to continually recruit prison officers to balance the natural process of people changing roles, either through promotions or career changes, and ensure our prisons are fully staffed. Being a prison officer can be a rewarding yet challenging career - so we want to make sure applicants understand as much as possible about the role before they apply. That's why we've developed a new tool that can help potential applicants decide if the prison officer role is right for them. We know it's not always easy to get a sense of how you’d feel working in a prison environment before even starting a job application. So this tool intends to give a realistic insight into what working in a prison environment is like through a series of short videos. It then asks you to judge how you feel after each situation. 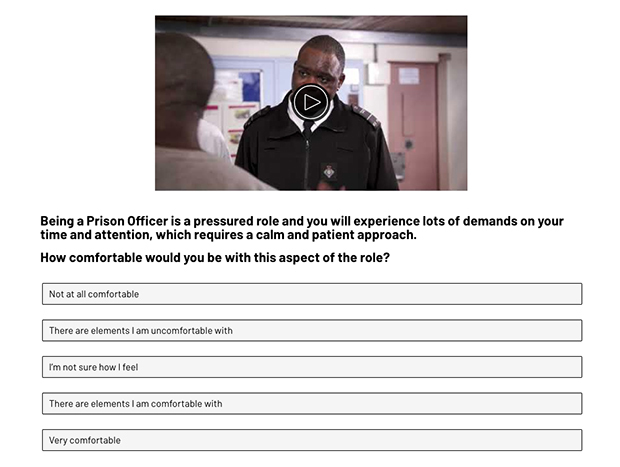 The tool is not part of the assessment or recruitment process, but something people interested in becoming prison officers can use to help them decide whether or not to apply. The tool consists of 8 short videos. After watching each video, you’ll be given a multiple choice question to answer. At the end, you’ll receive a result that’ll tell you how closely the prison officer role is suited to you, or if you need to do some more research into the career or if you should explore other jobs within the justice system. It was important for us to make the tool as authentic as possible. The people in the videos are real prison officers and ex-offender actors, employed by Synergy Theatre Project. Ministry of Justice staff - including a copywriter, prison officers and an occupational psychologist - helped write the scripts for the videos. Both groups of staff and ex-offenders advised on the script language and worked together during filming to create a realistic portrayal of prison life. Our hope is that the tool will provide a fuller picture of what working in the prison service is like, so that the right people are applying already with an idea of what managing prisoners is like. This is to ensure our prison service continues to be run by people who are confident in their role and committed to this rewarding, yet challenging, career. Try out the tool yourself and see if the prison officer role is right for you.